This map was issued in various editions from, roughly 1900 to 1937. Though most examples are undated we can assign an approximate date due to the development of the Metro system and the map's overall style and construction. engraved by L. Poulmarie and printed by Dufrenoy. Published by A. Leconte, of 38 Rue St. Croix de la Bretonnerie, and L. Guilmin, Paris. 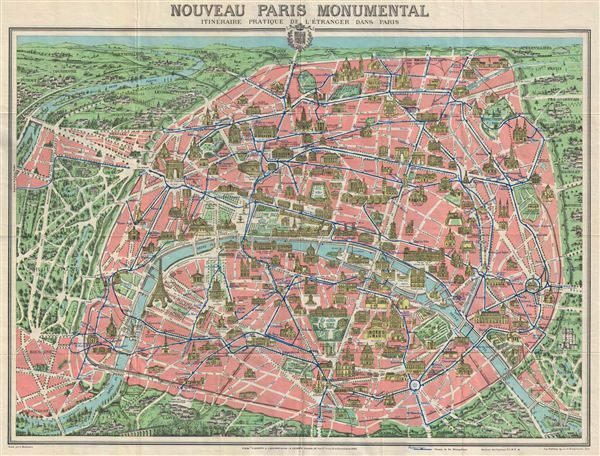 Leconte, A., Plan Monumental Paris & Environs Itineraire Metropolitan, (Paris: Leconte), 1928. Very good. Minor wear on original fold lines. Map of greater Paris vicinity on verso. Folds into original red paper binder. Conley, Tom, Cartographic Cinema, (Minneapolis: University of Minnesota Press, 2007), 141-2. Vallee, Leon, Catalogue des plans de Paris et des cartes de I'lle de France, (Paris: Bibliotheque Nationale, 1908),172, nos. 1306 - 1311.